One of the biggest complaints from those with feline companions is the challenge of litter box training. You may be training a new kitten and want to do it right, or you’ve adopted an adult cat who needs to be re-trained. Even your longtime companion may suddenly begin preferring your plants to his or her litter box, or your multi-whiskers household begins marking territory. No matter what the root cause, litter box training (or retraining) can be frustrating for even the most adoring pet parent. (And, sadly, it is one of the reasons why many trainable cats end up ditched at the shelter!) However, never fear. We know you love your kitty and want the very best for her, so you’ll be glad to know the problem can be solved. Before we delve into our training tips, one of the first things you will want to do is schedule an examination for your fave feline. 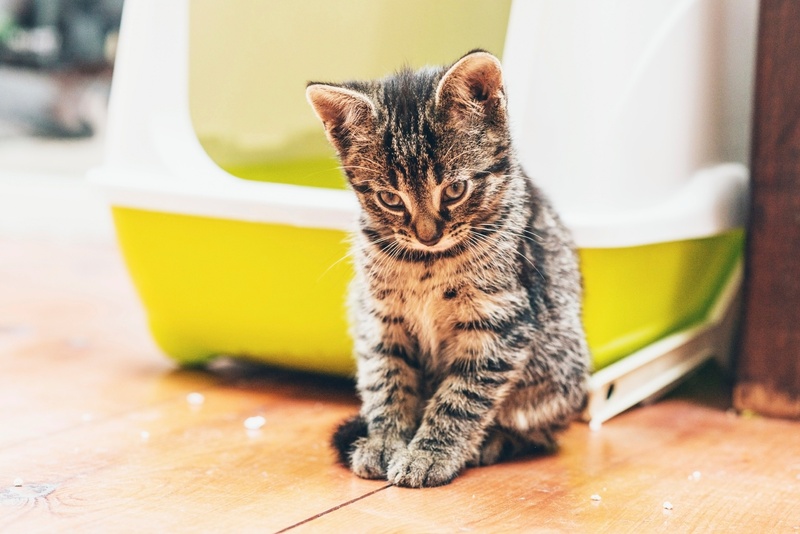 Your cat may seem healthy, but there are health conditions such as urinary tract infections, plus behavioral challenges, that may cause a cat to stop using the litter box. A trip to your veterinarian will help rule out any underlying problem and give you peace of mind. If your cat is about to pee or poop outside the litter box, pick him up and place him inside the litter box. You may have to show Whiskers “what to do”. This means placing him in the box on a regular schedule after feedings and scratching with your finger. Most cats are really particular about the brand and style of litter and the litter box’s cleanliness. If you find a brand of kitty litter that your cat prefers, try to stay with that brand if possible. Plan to scoop the box daily, and empty and disinfect regularly to satisfy our finicky felines. If your cat is avoiding his litter box, check cleanliness as a first step in unraveling the mystery of ‘why’. As for the number of boxes, the rule of thumb for multi-cat households is one box per-cat, plus one more. So a two cat household would have three boxes, etc. If you have a multi-level home, be sure to have a box on each floor. Place boxes in a quiet place away from lots of noise and activity if possible. If your cat has suddenly stopped using the litter box (and health and cleanliness issues have been ruled out), consider what’s been going on in the home. Have you been particularly stressed? Have there been any changes in the family, such as a birth or departure? What about a new pet? Some cats also get a bit stressed (and who doesn’t?) around busy holidays, where large gatherings, boisterous activity, and lots of noise can intimidate. If there have been stressors or changes, help reduce the anxiety by reassuring your cat through consistency, affection, and perhaps even a few weeks of confinement to a calm space within the home. Most importantly: practice kindness and patience. With assistance from your veterinarian and a few modifications, litter box woes will soon be behind you.